Grant Cardone defines leadership to its core, in its highest, greatest form. His massive energy, charm, and motivation of positive, successful thinking, are matched by few. 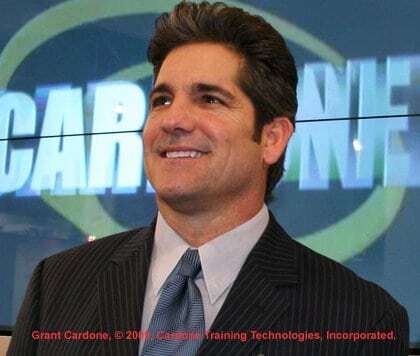 Starting from modest beginnings, Grant Cardone, who is also an inventor, is now the founder and owner of three multi-million dollar companies, a successful software company, a sales training and consulting business, and a real estate company with a portfolio worth over 100 million dollars. As if all that were not enough, Grant Cardone is now a successful author, and public speaker, lecturing around the world to industry leaders, managers, CEOs and entrepreneurs, on sales, money, finance, business strategies, and business expansion. If you have not yet read our first and second part of our interview with Grant, go to www.TheHollywoodSentinel.com Archives section to do so. Grant Cardone’s work has had a profound influence on some of the most successful companies and artists of our time. We are pleased to give you here, Part Three of the exclusive interview with this legendary man that other top financial experts are calling ‘The entrepreneur for the 21st Century,’ Mr. Grant Cardone. Grant Cardone: My advice for people that want to stay motivated, is over commit to everything they do! The trick that I use, because people are always like, ‘Oh man! You’re always so positive!’ You know, first of all, I said to this person, you know, you’ve only spent like maybe thirty minutes with me in the last two years. You don’t know if I’m always motivated or not… but what you see is that I am over-committed rather than motivated. Grant Cardone: But, if you see that I am always motivated, the reason you see that is because I over commit to everything. This morning I wake up, I’ve got a meeting at 7, I’ve got one at 8, I’ve got one at 9, I’ve got one at 10, O.K.? Oh, I have this thing at 10:30 I promised to do. I don’t really have time not to be in engaged in whatever game I am playing. I think most people aren’t motivated, because they just have too much free time on their hands. You know, I had too much time to play Asteroids as a kid. You know, me and my brother were bored and every time I was bored, I’d get in trouble. Look at kids today in the inner cities- they get in trouble when they’re bored! Keep em’ busy, you don’t need to buy em’ gifts, you know, they just want to draw, they want to scribble, they want to take a piece of paper, you know, I’ve got a four month old right now, and I give her a piece of paper, and you’d think that I gave her some million dollar Tiffany gift. She fully commits to the piece of paper and when doing so there is nothing that can bother her. She becomes absorbed with it. This is what people are missing. To keep myself positive I figure out, how to stay busy? People aren’t busy enough! How can you stay motivated when you’re watching Anderson Cooper? Grant Cardone: Or Fox TV? Or CNBC? You can watch the left or the right. There is no motivation there, you’re becoming a zombie. And so one of the things that I do, is I curtail the amount of negative inflow that I receive, so when we watch T.V., we’ll watch the creative channel. Or I’ll watch a movie that I’m in control of, or if I’m watching the news, I’ll Ti-Vo it, so I can blow through any thing I don’t want to see.